‘Race’ is an interesting topic, and it is one that everyone seems to have a different opinion on. Some say it is a very important issue today, some say they’ve suffered as it’s been used against them, and some say it’s not even a real concept. It’s a question asked on most government forms, and even when filling out a job application. Yet what is it really asking for when it says “Mark your race”? For one’s ancestry? For one’s cultural background? For one’s native language? For one’s skin color? If ancestry, all humans have genetic links and originate from the same population in Africa, and genetic tests have shown that we’re often most genetically similar to people of different skin colors. If cultural background or native language, Americans tend to have parents and grandparents with varying cultural backgrounds, languages and origins who immigrated to the great melting pot known as America. If it’s asking for skin color, many people from Brazil, America, Israel, France, Russia, and numerous other countries have the caucasian defined white skin, and many people from India, Ethiopia, Saudi Arabia, Brazil, Australia and numerous other countries have black and brown skin. In fact, someone with white skin can become someone with dark skin after a single day out in the sun. But What Is ‘Race’ Really? Who taught us what it means? Where did we learn accurate information about it? The confusion around the idea of ‘race’ is very real, and for good reason: ‘Race’ is not a subject seriously taught in public schools. Currently, students must rely on the teachings from often misinformed parents and an often racially biased media to get much of their education on the topic of ‘race’. The majority of Americans still operate on the assumption that there are legitimate biological ‘races’ within the human species, and that these racial categories align with physical features. Yet science has proven that such biological ‘races’ do not exist, and studies have shown that the historically recent way of trying to group people into ‘races’ based on physical characteristics and skin color has no foundation in biology and genetics. Is it Important To Learn About And Educate On ‘Race’? 3. Does it continue to affect people significantly in the present. From the very beginning of America, when European explorers made their first steps on a land occupied by Native Americans, ‘race’ was used as a justification for conquest and the seizing of lands. For hundreds of years thereafter, slavery was a peculiar institution used by and for the wealthy. ‘Race’, namely black skin, was created as the physical marker of a slave by plantation owners, identifying specific people as ‘less than human’, and who thereby were not able to leave forced labor and claim the rights set forth under the authority of Christianity of the time; that all who converted should be saved and set free. The most devastating war in America’s history, the Civil War, was fought as the nation divided in two over slavery; over differing ideas of ‘race’, the equality of all people, freedom and how humans should be treated. Yet again, in the largest war the world has ever seen that left an estimated 85 million people dead , World War 2 centered around the German Nazi party’s belief that there existed a superior ‘Aryan race’ and that all other ‘races’ were only fit for death. Everyone needs an accurate education on the topic of ‘race’ in order to fully understand one of the most impactful and dangerously influential subjects in human history, and which still permeates our 21st century society. Every generation needs to learn the same fact based knowledge supported by scientific studies when it comes to ‘race’ and human variation, to make a better world for us all. 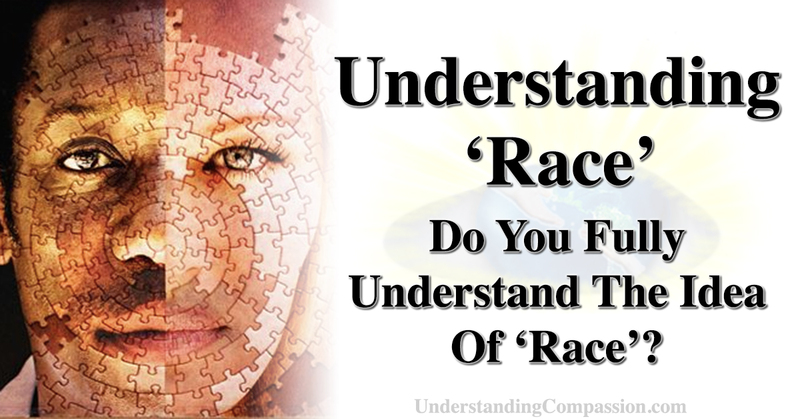 Join us at Understanding Compassion in the following 10 free lessons and enable yourself to truly Understand ‘Race’; one of the most significant, important and under taught subjects of our time.